Summer time can sometimes be a daunting time when you have an ostomy. Worries tend to focus around the heat, your supplies and how they’ll hold up and how to avoid being caught out or avoid a hospital admission. In this guide, I’ll be looking to the common fears new ostomates might have, along with some advice about how to lessen those fears and worries they might have. It’s also good information for well seasoned ostomates too; sometimes you just need a refresher or just some fresh eyes. With increased temperatures, you may find you perspire more than usual, but modern-day ostomy pouches are designed to stay sealed to the skin and stay intact for up to a few days at a time, even with the typical daily moisture such as normal showers, baths, and sweating. 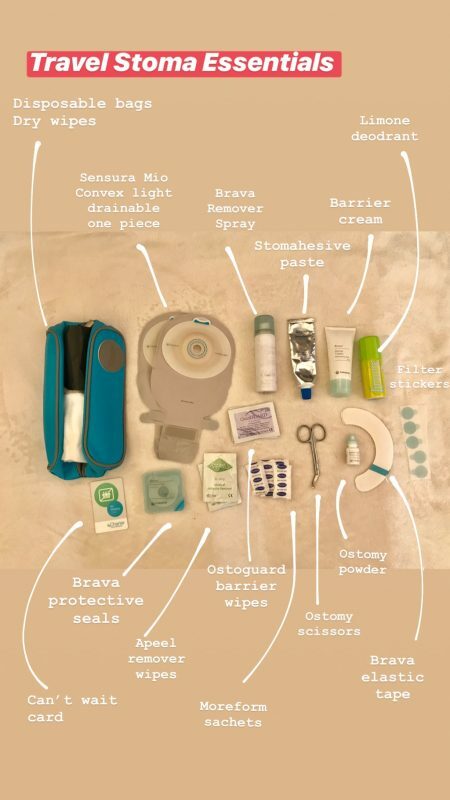 On average, people tend to change their bags every few days and reapply, but this will depend on your individual needs, rate of usage, and the type of ostomy appliances you use. Hot weather can cause some to panic that their bag needs changing every day or whenever it becomes loose, but keeping an eye on erosion – how much of the baseplate has been ‘eaten’ away by your output, it usually turns a darker colour to that of the flange edge – during an appliance change, and if you notice that there’s more erosion than normal, change it sooner the next time. If your appliance isn’t affected by sweat, then don’t sweat this extra step! You can use antiperspirants for your ostomy. A very experienced SCN told me this a couple of weeks ago; that if you use antiperspirants on the skin around your stoma it can help keep the sweating under your baseplate to a minimum. Whilst she said, this also explained this should be used as a replacement for your barrier step in your routine – if you use a barrier spray or wipe, that is! – as using both can cause a reaction. I have yet to try this myself, but if you feel like experimenting, please talk to your stoma nurse first to make sure that it’s going to be safe and appropriate for you. And if you’re considering using antiperspirants, go with an unscented and hypoallergenic product. It would be advisable to also test the antiperspirants on another patch of skin for at least a week to see if any irritation starts. Most ostomy appliances come equipped with a water-resistant adhesive that should seal quite well. However, if you’re having difficulties keeping your pouch sealed to your skin, there are special adhesives available that create a stronger seal than usual. Most stoma companies have a full line of extended wear products such skin barriers and various one-piece and two-piece ostomy pouches specifically created for those with an active lifestyle. Exploring these options before the weather turns, is a good ‘thinking ahead’ plan. Having the ability to find a product that is either a good all-rounder, one that is more suitable for you to use when active, or one that holds up well under the heat of the weather; is always good news. If you’ve been changing your pouch more often and the skin surrounding your stoma has become more irritated – redness, chafing, bumps, etc – this is because the skin is more susceptible to breakdown when it is hot and moist. This includes the area where the ostomy appliance sits, which can form rashes because of the friction of the pouch against the skin combined with heat. You may want to look into a powder to absorb perspiration. If you have trouble with ostomy appliance leaks because of moisture, you can also try stoma paste or seals to create a stronger, more reliable seal. Avoid using any Karaya rubber-based ostomy wafers in high heat conditions. This rubber material is soft and conformable, but in hot conditions it can break down and even melt. It’s best to use a synthetic wafer which tends to have a higher heat threshold. Be cautious when using tape or other adhesives to reinforce the edge of the flange or barrier border. If there is sweat beneath the barrier and the seal breaks down stool or urine could collect and cause skin irritation. Taping is a good option if you are engaging in activities where there is more movement of the abdomen. If you have pre-existing skin issues or a diagnosed hernia or need convex products, it is always advisable to speak to your SCN or directly to the stoma company for some guidance and advice before using new products. Some are suitable for all, others find them not so. However, issues such as leaks and sore skin, is not something you should have to just ‘put up with’ and struggle to battle on a daily basis. There are products and tips to help you out, if needed. There is a recommend list of products at the bottom, but rremember; these work for me, but might not work for you. Use with care and common sense. Stoma bags also have a manufacturing date as well as an expiry date! Ostomy products – from the pouches to the supporting products – require an ambient temperature when being stored. 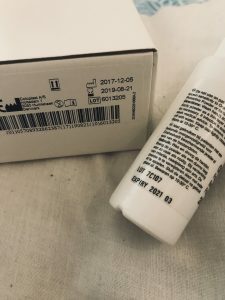 So, it is best to be stored away from direct sunlight, away from damp and always checked regularly to make sure they are in date; YES they have expiry dates on them! When taking products out with you on a daily basis, depending your needs, it would be recommended to take two or three changes. 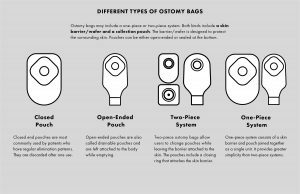 This obviously depends your type of stoma – for example a colostomy would need more pouches on hand as they are closed, and an ileostomy would need maybe one spare drainable pouch – and your supporting products. Keeping these products in a small bag is advisable, so that they are all in one place but also so that they are not in contact with direct sunlight too. Remember, to keep a check on the expiry dates of these products too, its easy to forget if you only keep an emergency change set with you! When it comes to carrying adhesive remover wipes and barrier wipes, make sure you rotate these products regularly; they can become dry over time due to being exposed to the elements when you go out and about. Remember, on hot sunny days, it doesn’t take long for the temperature inside your car to soar, so be sure not to leave your ostomy products and other medical supplies in the vehicle. Getting Enough Fluids – Be A Hydration Station! If you have a stoma, it is particularly important to drink enough water to keep yourself well-hydrated. Common sense would suggest that you should be replacing the fluids you’re losing, but if you aren’t used to sweating a lot then you may underestimate the amount you need, thus the more you sweat, the more fluids you will need. The easiest way to overcome this is simply to add more liquids to your daily goal, but it also helps to consume more water-rich foods, which as a bonus, will help to cool you down during the summer. My favorites during the hot months are watermelon, honeydew melon, grapes, cucumber, and mangoes. Don’t be afraid of electrolytes! Water isn’t the best way to stay hydrated as it has no electrolytes. If you have an ostomy, specifically an ileostomy, then you will benefit greatly from drinking fluids that contain added electrolytes. These may include commercial or homemade oral rehydration solutions.. It is worth asking your doctor for a goal when it comes to electrolytes as you do want to make sure you’re getting enough – not too much, not too little. This can take a little tweaking to get right. ORS drinks can be useful if you have a short bowel or a high-output ileostomy, but with these conditions you may also need to restrict your total intake of fluid to avoid dehydration. This is because drinking too much plain water can wash essential salts out of the small intestine and into the stoma bag. As water is best absorbed together with sugar and salt, loss of these salts through stoma output can lead to dehydration. Your IBD team will tell you ifthis is the case, and can help you to manage your general diet and fluid intake. Find other ways to keep cool, even if it means using the air conditioning or seeking shade, finding ways to reduce direct exposure to the sun and heat will help to combat dehydration. With a few precautions and tweaks to your ostomy routine, you should still be able to join in on summer activities. Remember to pace yourself, especially if you’re coming back from a long-standing illness or recent surgery, because pushing yourself will only negatively impact you. Always carry extra fluids with you! Regardless of where I am going, I always keep water with me. Even just travelling to work or going to an appointment. You never know if there will be an opportunity on the way, or even at your destination. When it comes to travelling away for more than one night, I always take supplies for one change per day. This is more than my usual routine, because when I don’t have supplies, something is bound to happen. When going for a longer distance, keep some travel versions of supplies and stoma bags in your hand luggage as well your suitcase. There is no guarantee your bag will make it your destination, so it’s good to have some as a back up. Also, aerosols – your barrier sprays, remover sprays and deodorants – are bulky for hand luggage so I have the wipes of those items handy for a change if needed. Carry some high-energy, easy-to-digest snacks. The heat tends to make me fatigue and cranky, so I always make sure that I have a protein bar in my bag, in case I’m feeling sluggish. Favourites are the Nakd bars which come in various flavours and I always carry marshmallows too. An ileostomy requires two to four more cups of fluid each day because of high liquid output. Drink fluids before going out to summer activities. Favor water, fruit or vegetable juice, and sport drinks, over alcohol and or caffeine beverages. Bring liquids with you and take frequent sips. Drink ten glasses of water each day, and even more if you have an ileostomy or urostomy. Wear loose clothing, especially loose at your neck, wrist and ankles. Keep your shirt on in the sun. Some IBD medication can cause skin sensitivities or increase the risk of skin cancer. It is always good to wear sunscreen/sunblock, not only is it keep your risk of skin cancer at bay – with frequent reapplication too – but it also helps if you are taking Azathioprine or Mercaptopurine as they definitely come with a sun exposure warning. There are others, but please check with your IBD team with regards to your own medications. Keep your scars out of the sun! If you have scars, especially fresh ones – less than 1-year-old – please keep them out of the sun as much as possible, or use a sunblock. UV from the sun is believed to cause scars to redden and most likely causes skin damage that you simply don’t need. When it comes to keeping your bag out of the sun, it can be useful to use bobby pins / hair grips to hold the bottom half of the end of the bag off your skin if you are sunbathing. However, please don’t spend too much time in the sun and always use sunscreen. Coloplast Brava Ostomy Powder and ConvaTec Orahesive Powder; both of which are great at absorbing excess moisture and healing broken skin. Apply after your barrier routine and use only where needed. It should be a light layer! Coloplast Elastic Tape – always provides me with an extra layer of protection, holds up well under swimming, showering and bathing. Just don’t cover all the baseplate as it can be difficult to get off without a gap! ConvaTec Stomahesive Paste – excellent at filling dips and crevasses. Also great under the hot weather and holds up with perspiration. OstoMIST In Pouch Odour Neutralising Drops – Gardenia & Jasmine – my preferred fragrance but they also do Mint and Tangerine. Coloplast Sensura Mio Convex Light one piece drainable – my regular go to bag. Holds up well under the heat, the adhesive on the baseplate is strong and does not react with my skin. ConvaTec Esteem Flex Convex – a great one piece fabric option. Also the Hollister’s Conform 2 – drainable pouch with the Convex Flexwear barrier – great as a light and flexible two piece option. Smart Water – available at supermarkets nationwide and small local convenience stores. Nakd products – favourites are Cocoa Delight and Cocoa Orange. If you like peanut butter, the Peanut Delight is lovely too.